Miami-based Criptext is not the first and only encrypted text messaging app around, but it does provide large corporations and governments a secure platform to control the confidentiality of their organization’s communications. 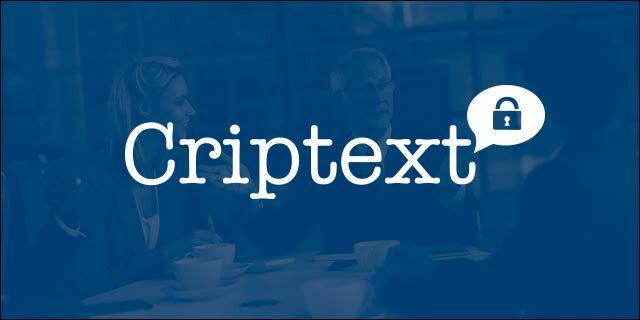 Criptext launched this week at TechCrunch Disrupt NY and offers companies a unique platform to exchange information without privacy leaks. The company launches amid growing concerns over privacy issues in messaging applications. The platform works by granting the account administrator full control over who has access to specific functionalities and who doesn’t. When a user receives a message, it appears in a separate window, not tied to the sender’s name, and all information is deleted after 14 seconds – with no option to save it. Additionally, the messages are screen-shot proof, providing another layer of security. Although the company just launched today, Criptext’s clients already include one international government and a major corporation, both of whom use the platform for internal confidentiality purposes. Criptext is an accelerator company at Venture Hive. Camila has been heavily active in South Florida’s tech startup community, where she is a co-host of a local radio show called pFunkcast. Camila previously worked at Greenpeace International and the Organization of the Prohibition of Chemical Weapons (OPCW) in various communication roles. A proud Brazilian who spent most of he life in Peru, she is passionate about traveling and documentaries.